After contract brewing for a while in Irvine, Butcher’s Brewing has found a more permanent home in San Diego’s Santee. Before opening in early May 2013, Rey Knight (brewmaster and owner) and his crew made a few renovations to the old Manzanita brewery and tasting room including the addition of a few more taps for a total of 15. 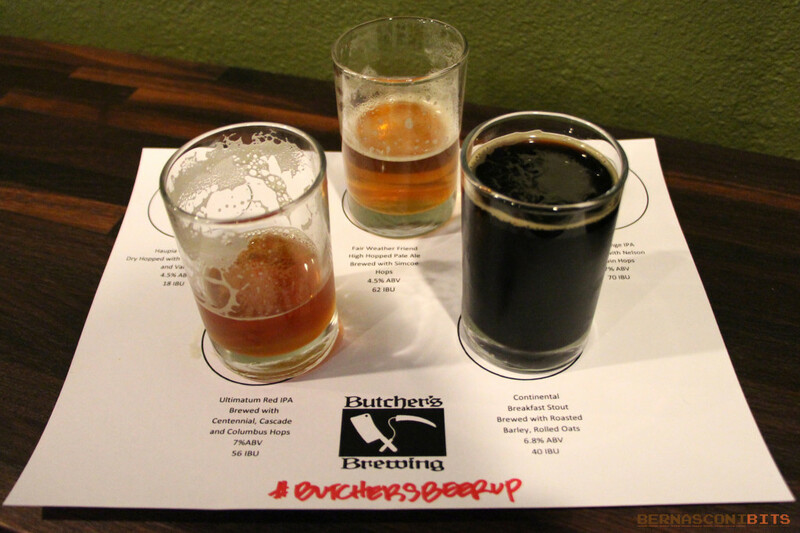 I had the opportunity to attend the #ButchersBeerUp for a short tour and to sample what Butcher’s been brewing in East County! We’re yeast farmers. We tend to yeast, we keep yeast happy, and the by-product is beer. Before the tour, a group of local beer lovers gathered in the tasting room to sample 5 of Butcher’s Brewing’s beers: Haupia Cream Ale (4.5% ABV, 18 IBU, dry hopped with roasted coconut and vanilla), Fair Weather Friend High Hopped Pale Ale (4.5% ABV, 62 IBU, brewed with Simcoe Hops), Free Range IPA (7% ABV, 70 IBU, brewed with Nelson Sauvin Hops), Ultimatum Red IPA (7% IPA, 56 IBU, brewed with Centennial, Cascade and Columbus Hops), and Continental Breakfast Stout (6.8% ABV, 40 IBU, brewed with roasted barley and rolled oats). I had just finished a hike through Mission Trails Regional Park and was thankful to start off the tasting with the light and refreshing Haupia Cream Ale. I could have drank it all day but there were four more beers to sample. Fair Weather Friend was a nicely balanced combination of hoppiness and a pale ale. This would be a great beer for sitting around the back yard and enjoying the sunshine. It might of just been the thirst, but Free Range IPA was a little too hoppy for me. I will try it again. On the other hand, Ultimatum Red IPA is deadly! I like reds and IPAs and the smooth combination of the two was so delicious I ordered a pint after the brewery tour. The Continental Breakfast Stout rounded out the tasting. The interesting thing about this stout is even though there is a coffee flavor, no coffee was used in the brewing process. I would like to return to the brewery and try this one again on a cold fall evening. From top to bottom, my choices would be Ultimatum Red IPA, Fair Weather Friend, Haupia Cream Ale, Continental Breakfast Stout and Free Range IPA. We use a gravity-fed system because gravity rarely fails. 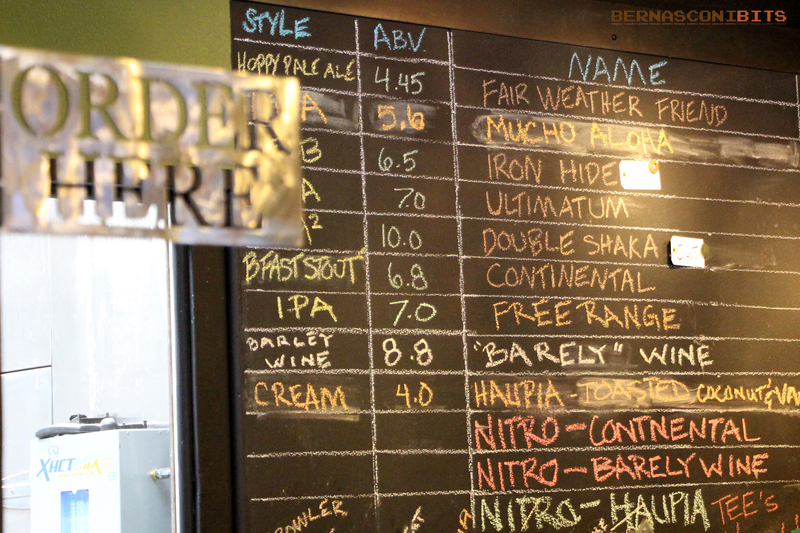 According to West Coaster, Butcher’s Brewing is the 72nd brewery in San Diego County! The brewery setup consists of 11 repurposed honey tanks which each hold 7 barrels of beer. Because of it’s smaller capacity, Rey considers Butcher’s Brewing a nano brewery. The nano-brewing system is set up with some high-tech temperature controls (the same controls used by White Labs) that provide the brewers with the ability to change barrel temperatures on the fly from an iPhone. A heater on the roof helps with the cold desert nights and is definitely not needed during the warmer months when the temperature inside can easily reach 104°. 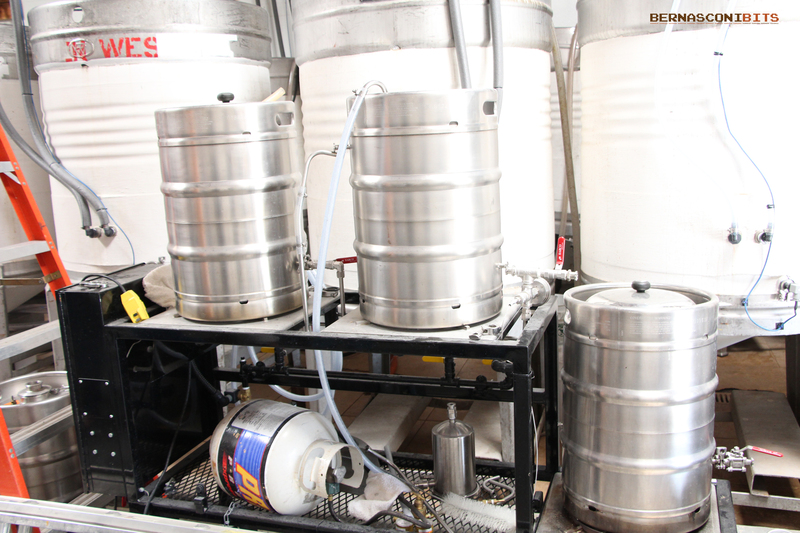 The brewing system technology can also change the water hardness on the fly. Since water makes up 90% of beer, the water hardness is very important. For example, hard water is used when brewing a stout and soft water is used for pilsner. So next time you are exploring San Diego’s East County, stop by Butcher’s for an Ultimatum and tell ’em Bernasconi sent you (they won’t know who I am, but it’s the thought that counts).